We know that there are hundreds of superheroes and that everyone has their favorite. 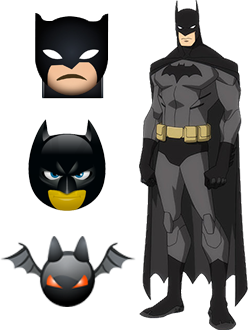 Today we bring you a collection of superhero emoji which, from our point of view, are the best superheroes of Marvel Comics and DC Comics. You will be able to use these emojis in your talks with friends. It does not matter which operating system you are using because they are compatible with both iOS and Android or your favorite chat application, because they are consistent with Facebook Messenger, WhatsApp, Snapchat, Twitter, Instagram, Kik, and Skype, among many others. His first adventure dates from the distant 1938, when it was published for Action Comics. The creators were Jerry Siegel and Joe Shuster, who devised a Superman with supernatural powers that only had a weak point: the famous green kryptonite. Its evolution became evident over the years. From being a somewhat quiet and rude guy in the beginning, he gained empathy with the public for his nobility, purity, and above all the desire to always help the needy and save the world when it was necessary. As for the films, Christopher Reeve was the best hero of the cinema, or at least the most similar to the classic character, although lately he has been beaten by Henry Cavill. Millionaire and seasoned philanthropist, Batman’s greatest key and what makes him special in the eyes of the whole world is that he does not possess great superpowers. He is an athlete, a fighter, a good man, a seeker of justice, but above all is human, although he conceals his identity behind a mask. The character, created by Bob Kane and Bill Finger, has taken to film and TV on many occasions, of which it is necessary to emphasize the first two films of Tim Burton, along with the recent reinvention with the original and more worked and deep reboot of the Christopher Nolan trilogy. Dr. Bruce Banner loses control often when he transforms and becomes that enormous body, almost indestructible and green. When it is serene Banner’s brain compensates for its fragility. However, the fury and anger that are put in the body of the green “monster” make everyone afraid of the consequences. In short, Hulk is big in every way. The wall-crawler kept a place in our hearts with his closeness, humanity, sympathy, vulnerability and even by his apparent simplicity at times. His romance with Gwen Stacy, then with the exotic Mary Jane, his working relationship as a photographer at the Daily Bugle where he must put up with JJ Jameson… there’s no funnier guy in New York or anyone we want to meet more. In addition, his adventures end up being full of fun, adventure, and romanticism. We love you, Spidey. The fastest guy DC Comics came up with was this nice guy in a red suit with a yellow bolt across his chest. Aside from super-speed, The Flash has a special ability for reflexes. There have been several “Flashes” that had connection and union with the “Green Lantern” in successive stages. In the case of The Flash, the first and original was Jay Garrick, and it is he who wandered through memorable adventures in the first golden stage of the character. The first Flash, along with the first Green Lantern, among others, gave rise to the founding of the Justice Society of America. In the 1940s, after World War II, although the United States had not yet participated in the contest, seeing patriotic characters in comics was starting to become habitual. The fact that a young, thin blonde character was thrown out of the army made him try his luck in an experiment to help his country in some way. Rogers took a special serum that would end up turning his skinny body into a super-soldier. Only 7 pages drawn by John Byrne were enough to give the key to what this character would end up being in the future: an absolute icon. 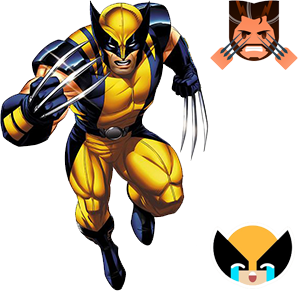 Wade Wilson was part of the Arma X project, as was Wolverine. He obtained the power of rapid regeneration, which turns the character into a practically immortal being, but that left him with his body full of wounds … and his mind was wrecked, with a triple personality and a spice of psychopathy that makes him totally unpredictable. He is a full-fledged antihero, who has a close friendship/hatred relationship with Cable. Billionaire and engineer, with a genius brain and some boasting, but above all Iron Man is someone who designs new technology in order to improve humanity. His leadership in the group of the Avengers is much more recognizable in the films than in the comics, but Tony Stark will never cease to be attractive thanks to the face of Robert Downey Jr. There is no doubt that Iron Man is worth much more than it seems for its packaging and special charisma. The mutant most charismatic and attractive for dozens of reasons, emphasizing one of his greatest powers (an adamantium-covered skeleton, claws included, in addition to its curative power of recovery). Logan supplements his small height with strength, courage, and his will to fight to the last drop of sweat against whoever stands against him and deserves it. He never leaves anyone hanging because despite his savage brutality. Verify your device compatibility by installing a free app on your phone. You will have to run it for about 30 seconds. This is just a simple compatibility process to make sure us to offer you a compatible version. You can now add your new emoticons to your text messages. Be a SuperHero! If you have not found your favorite superhero emoji, we invite you to watch our collection of Marvel emojis and DC emojis.